Bear in mind, Mr. T is in 8th grade. Hey Mr. T, want to smoke some weed? Back off, man. I don’t have time for your uncool drugs. Can’t you see I’m measuring here? Seriously, what is the purpose? 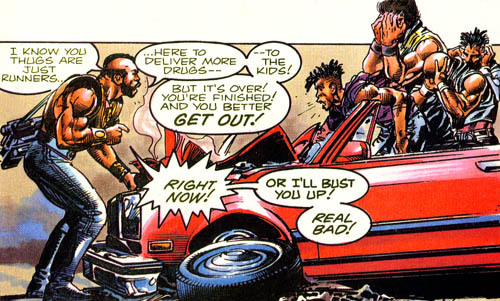 Mr. T has a long history of anti-drug advocacy. 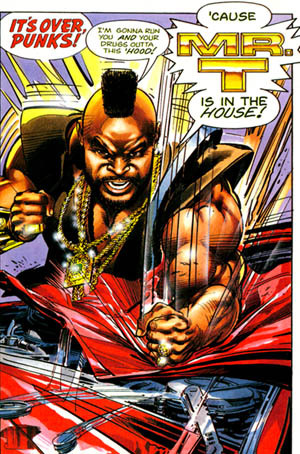 Here he is in a Mr. T and the T-Force comic book. 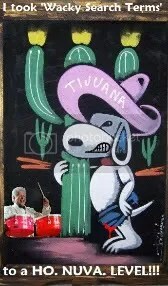 After he beats up the drug runners, he follows the sound of a crying baby to a dumpster. These comic books are obviously a much more effective take home message vehicle in the school-age anti-drug campaign than rulers and plastic cups will ever be. I mean, there’s nothing like a few tears to fully convert you to a cause. Uploaded by QualityInformation. – Click for more funny videos. I pity the fool who has to use that ruler! 😛 That PSA link is hilarious!! That ruler comeback was awesome. BratzBasher gets D.A.R.E. pencils that change colors — like those hypercolor t-shirts. Remember those? 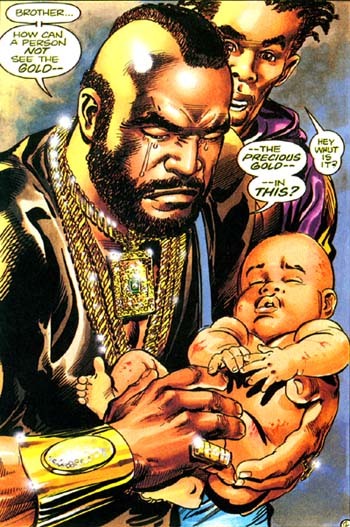 Wait, the “precious gold” in the baby or around T’s neck? The ruler line is a classic. This whole post was so inspiring, I’m going to go throw out my tylenol. I’m feeling deeply ashamed right now because that crack baby line made me LOL, and that’s just wrong. Oh, but if anyone offers him drugs, he can whip that ruler out of his pocket. I’m scared of Mr. T. The real Mr. T. Not your son. I don’t know what you are all talking about. 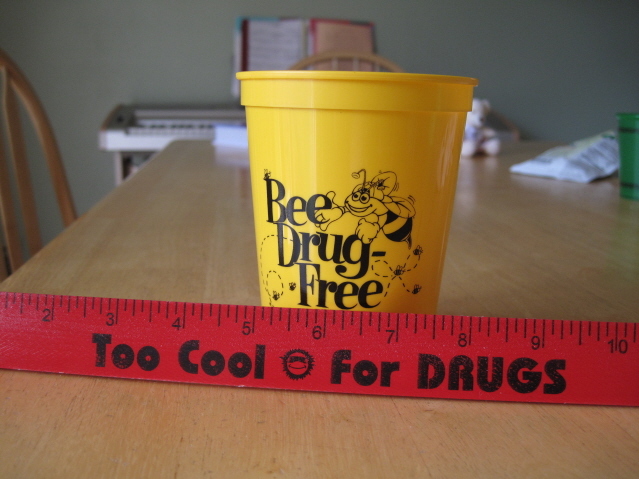 I know the first thing I look for when tempted by drugs would be the yellow sippy cup. I know, it’s not really a sippy-cup but I’m sure it was meant to be. Perhaps they overstocked the Kindergarten class and thought the 8th great could benefit from the supercool Bee Drug free! Mother—I’m glad to do my part to help keep your boys drug free. Foo4luv—Now hypercolor pencils would be cool–like an acid trip. Alison—I’m glad to do my part to help keep you drug free. Madhousewife—It’s the “fool”. You tack “fool” onto anything and it becomes instantly funny. “Your house burned down, fool!” “You got cancer, fool!” “Your dog died, fool!” See? Patience—A twelve inch ruler is a pretty handy thing to have stashed in your pocket. Flip—Scared of Mr. T? Don’t you see the tears and the tender way he’s cradling that crack baby, fool?! Lora—That’s exactly what I thought. That there was no possible way these items had been originally intended for that age group. Mr. T said they also had those rubber wristbands, but he didn’t take one because they said something really lame. I just gave him a blank stare. I have nothing further to add. Just know I’m LOLing in my bathroom right now. I just remembered that Merkin told me about getting pencils that say “TOO COOL TO DO DRUGS”, but they started the sentence on the writing end of the pencil, so all the kids were sharpening theirs down to say “COOL TO DO DRUGS”. Another brilliant idea.